The project 64 team are happy to release project64 1.6. Jabo and I are extremely busy these days but do find time now and then to work on project 64. We are both extremely happy with the stability and compatibility of project64. There have been some small issues that we wanted to fix to give the users a better experience. You can read the full Post he made Here and also the release on both PJ64 downloads and here on the download page. Due to real life commitments I just don't have the time I used to have. I can no longer sit on IRC & help in real time like the mad 18 hours a day that I used to do. when help was needed no one else filled my position to offer the help I used to. So there is no point keeping the support going, when there will not be any support given. or the guides still haven't helped solve your problem. Stating your problems and what guide you have followed and did not help. as we feel there will not be much to do to it soon. So once 1.5.1 Cheat File Final is out that will be our last file for quite awhile. Users with no internet Connection/or can not stay online long. without the need to go online for a quick FAQ Or what game has cheats. This really is a superb release. 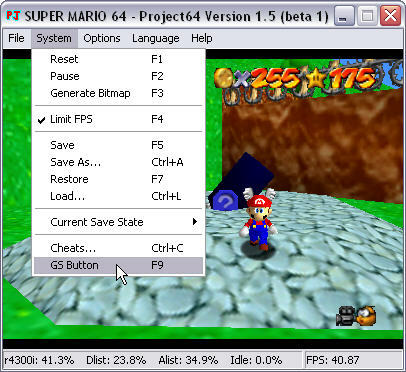 There are loads of fantastic fixes and Changes to Project64 look and feel. So make sure you read all the What's new and Readme's. What else could possibly be new on the cheats front ? 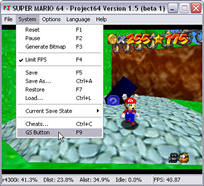 well, infact a lot more since Project64 1.5 beta1. The ability to add more then one cheat code at a time. The ability to add Modify Cheat Codes. The ability to Edit and Delete cheats. just click the pj64 icon above. to be used just as they should be. this really is something quite special indeed. problems from the past when using cheats in games. when trying to use cheats in PJ64's of the past. But with the implementation of these in 1.5 beta1 it has put a end to such troubles. has also been added to the Help options short bar and the Windows 2000 Index and Contents Bug has now been cured and is fully usable. for quick enabling Or disabling of Cheat Codes when the game has been loaded..
but have tried it, and welcomed it, as a Official Release. and we hope you will all agree. and visit the news page, just click the pj64 icon above.